Call of Duty, as a video game series, has had a “zombies” mode since Black Ops 2. It didn’t have anything to do with the actual game’s story, but it was a bonus that appeared after the credits rolled. Originally Nazi Zombies, the mode morphed into almost a full co-op shooter all its own. I still think that Activision could spin off Zombies into its own game at some point. It’s certainly got the following by now. While that has yet to appear though, this new Dark Horse series should fit the bill for those wanting more of the horror sub-series. Call of Duty: Zombies starts off the action in England, 1912. It’s there that we’re treated to a short introduction before rewinding a bit to the blistering heat and barren landscape of Morocco – two years earlier. This is where the majority of the story takes place here in this first issue, though with the intro I doubt it’ll stay there. Actually, it kind of seems as though the narrative from writer Justin Jordan might be jumping around a bit. I just got that sense from it. 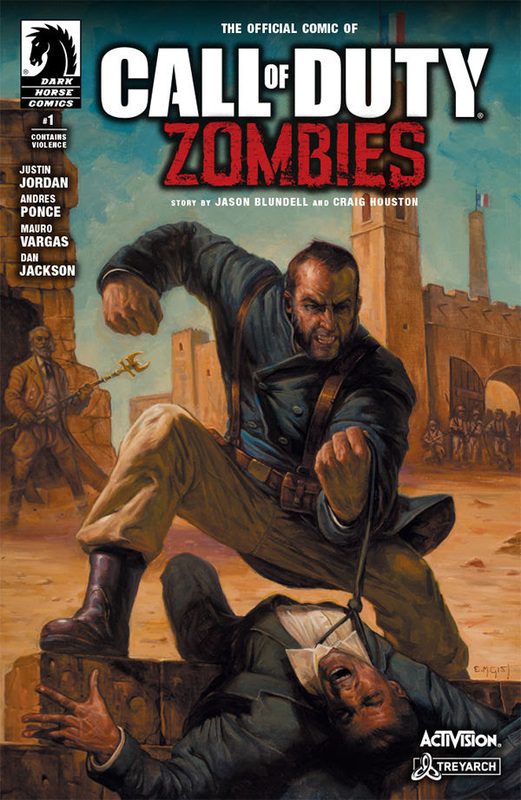 This issue however, focuses on Alistair Rhodes and Bruno Delacroix, two unlikely heroes. Rhodes is a scholar on the hunt for an ancient relic, and Delacroix is a former hitman-turned-Legionairre who’s on the run from a few things. Both are solid characters, though there’s not much of a villain. I’m pretty sure it’s not till the last few pages that we get introduced to a group that’ll be the actual heavies in this series. That’s not to say that there’s not a ton packed into this issue. With some terrific action, surprising amounts of gore, and a few really cool plot devices, it’s a lot of fun. The whole thing has a real Indiana Jones feel to it, which I wasn’t expecting. I was thinking this would be more low grade horror flick, but it definitely wasn’t. Jordan has done a good job setting everything up, and making things suitably compelling. While the story is quite fun, I am a little torn about the pencils by Andres Ponce here. I’m not familiar with Ponce at all, so I don’t know his work, but it seems hit and miss in Zombies. On some pages however, it pops, with good detailing and some great looking characters. There’s one scene with some severed heads that’s very cool, and while opening is great. Then there’s a more mystical scene, that absolutely stunning, partially with thanks to Dan Jackson’s great color work. Though, that’s not a constant either. Jackson is muted by the setting itself as we move to Morocco, and that might be true of Ponce’s art too, since again, the opening is great. It just seems very sparse in parts, and there aren’t a lot of backgrounds happening. Excluding backgrounds from select panels, instead highlighting the direct action happening, can be a great trick, but it seems to be used too much here. I hope for a little more of the opening style in issue #2. Overall though, Call of Duty: Zombies is off to a fast start. There’s a fun story here that I actually care about seeing to its conclusion. Honestly, I didn’t think that was going to be the case either. This is a video game tie-in for a series that’s not exactly known for its narrative. But it surprised me, and I think it might do the same for you. That’s especially true if you’re an Indy fan. I am very surprised by Call of Duty: Zombies #1. Not only is there some very good action and a fun plot, but the characters come off well and there's a great Indiana Jones vibe happening throughout. Yes, I thought the art was a little here and there, but overall this is way better than a lead in for the game should be. Looking forward to issue #2!